Kadai Chicken Recipe is the most popular spicy and delicious recipe in Pakistan and North Western region of India. 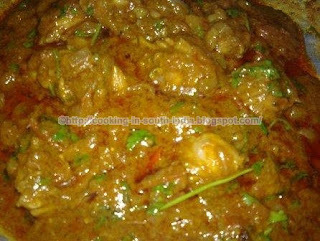 This recipe is also known as Karahi Chicken or Chicken Karahi because the name Karahi is a type of Vessel used to cook, which is a thick bottomed circular and deep bowl like pan. 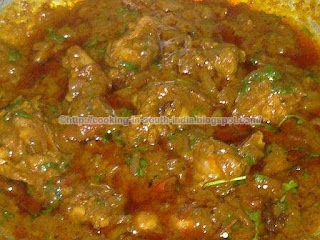 This recipe is nowadays popular in South India also. Let us see how to prepare delicious Kadai Chicken Recipe. Wash the chicken then add turmeric powder and some salt and keep aside. In a thick bottomed kadai/Pan add oil and then add chopped onion, note that Onion is the main ingredient for Kadai Chicken. When the onions become transparent add finely chopped tomato, fry the tomato until it become mashy. Now add the chicken pieces and fry for two min then add ginger garlic paste, red chili powder, coriander powder, cumin powder and salt then fry it well, Add required water to the chicken and allow it to boil for around 10 minutes and you may see the oil starts separated and comes to top, garnish with coriander leaves and you may feel the aroma of the gravy. Serve the Kadai chicken hot with Rotti, Paratha or Nan.